I love when hard-awesome things like this take place. Writers supporting one another while expecting nothing in return. Just for the sheer joy of encouraging & celebrating. In that vein, I hope you keep spreading the love. I’m in awe of authors. All authors. People who work hard to create a rich and textured story, and then work harder. And then even harder. And then do that about a billion more times. And then they show it to the world. That scares the crap out of me. A few months ago, it came to light that a writer friend of mine was thinking of releasing a book that sounded so freaking good that I couldn’t help but squee all over the place (which is to say all over twitter). It’s a novel that was really close to her heart, she said, but she was concerned. It wasn’t like the young adult novels she usually writes, the ones she’s known for. It’s about two boys who fall in love. 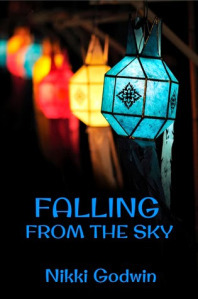 It’s called FALLING FROM THE SKY by the very talented Nikki Godwin. ← What Are the Chances of a Book Becoming a Movie?